I have enough material to write every day nonstop for years on end, but then I’d be missing something. I’d be missing life. Books are at most an imitation of life, sometimes a sweeter life, in my case often a paranormal life. I am constantly in a state of working. Today I took time even in the rain to take part in a family tradition. Many rural states love the fair. It’s where you get to meet sheep up close and personal. You can admire the truck pull. We love to play the carnival games. Of course, there’s the food. My granddaughters started out with chocolate donuts. Missing from the photo are my two daughters. 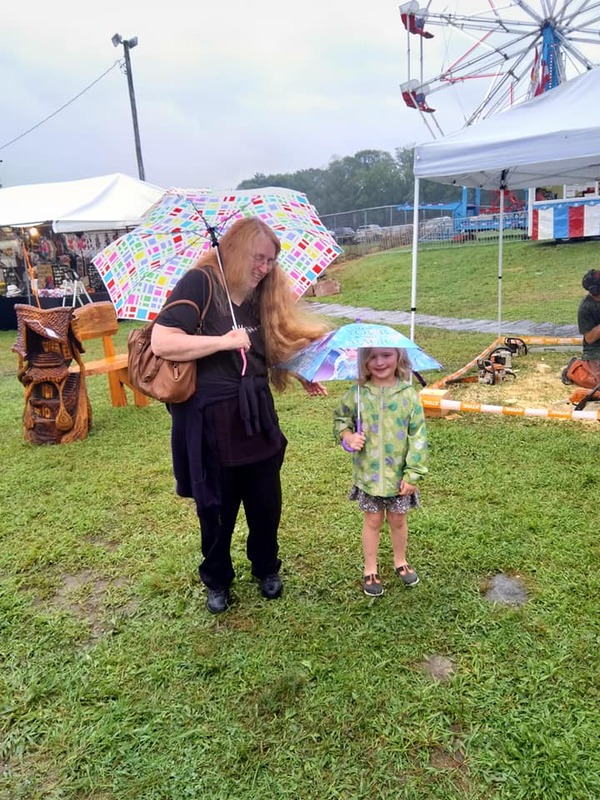 One took the photo, while the other declined the fair due to rain. The one taking the photos is also expecting a baby any day now. Dinosaurs are very big this year, and they had a few. 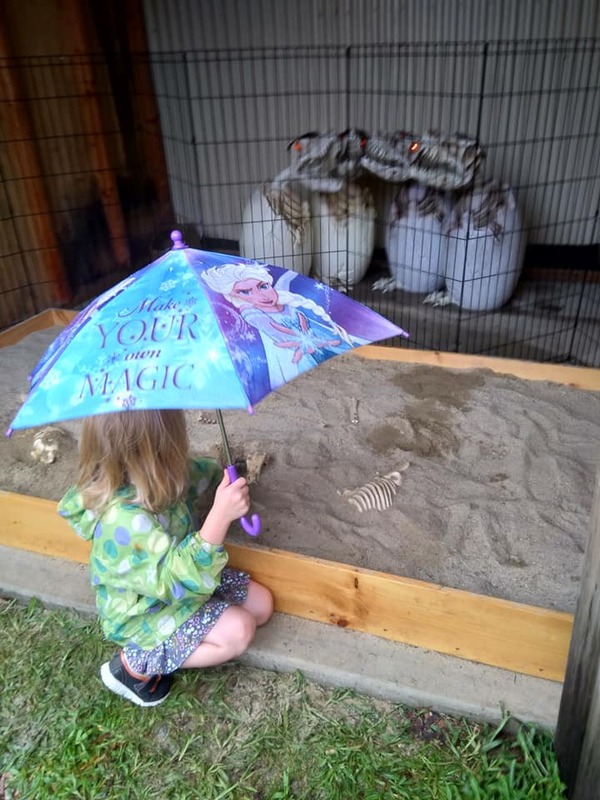 They had a dinosaur bones digging/brushing experience for the young people, while they were serenaded by four hatching dinosaurs. My oldest granddaughter especially enjoyed the wood carving! It’s an intricate artistic eye that can create something beautiful with a chainsaw like a fairy house/bench behind us. Unfortunately, with the increasing downpour, it was time to go home. 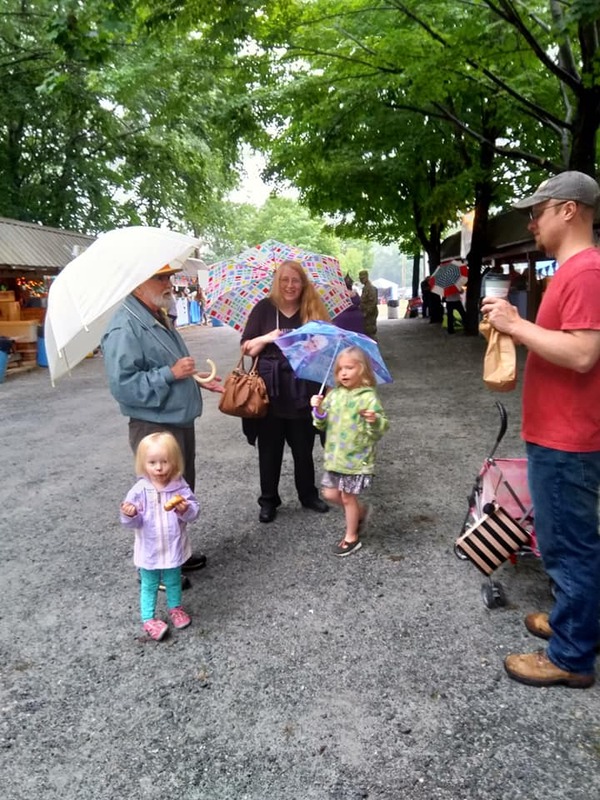 We are lucky that in Connecticut, there are so many fairs. We’re bound to attend more where our visit isn’t cut short by the rain. So, what do I do now that I’m home again? I write, of course. I’m learning graphic art, too. I’m making book cards! Enjoy! I hope your Sunday is filled with joy! 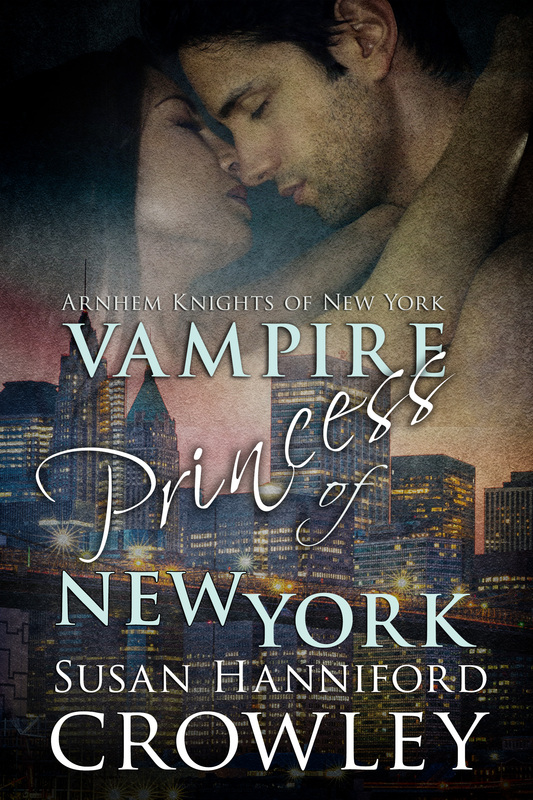 Vampire Princess of New York, Arnhem Knights of New York, Book 2 is available in Kindle! In Amazon Print! In Barnes and Noble Print! Link | This entry was posted in Author, Paranormal Romance, Susan's Snippets!, Writing and tagged Amazon Kindle Bestselling Author of Vampire Romance, An Author & Family Play Day by Susan Hanniford Crowley, country fairs, dinorsaurs, enchanting family day, family, grandchildren, Paranormal Romance, Supernatural Romance, Susan Hanniford Crowley, vampire adventure romance, vampire family saga, Vampire Princess Noblesse Vander Meer, Vampire Princess of New York. Bookmark the permalink. Sometimes, those real adventures become great material for writing.